The January 2007 issue of Panorama, the magazine of the Deutscher Alpenverein, contains a striking study (see the 21st slide) of the fatality rates on the fourteen 8,000 meter mountains. To my surprise, Annapurna is far and away the least climbed and the most dangerous. Since the first successful ascent by the French Himalayan Expedition, led by Maurice Herzog in 1950, Annapurna has been climbed a mere 142 times. Compare this with Mt. Everest -- Everest has been climbed 2,561 times. 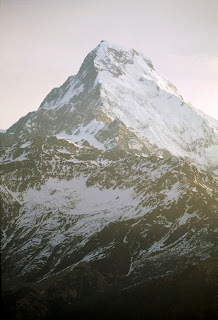 The next least climbed is K2, which has been climbed 249 times, almost twice as much as Annapurna. Annapurna is truly the loneliest summit. Not only is Annapurna the least climbed, it has by far the highest fatality rate. A total of 58 climbers have died on Annapurna -- a fatality rate of 40.8%. This is an astonishing statistic, especially bearing in mind that Annapurna, unlike Everest, is not assaulted each year by dozens of teams composed of wealthy but unqualified climbing tourists. Notwithstanding the legions of amateurs on Everest, and its many celebrated climbing disasters, only 192 climbers have died on Everest -- a fatality rate of just 7.5%. Nanga Parbat, which is the third least climbed 8000 meter peak, and which I would have thought the most dangerous -- it has a reputation as the "killer mountain" --, has a fatality rate almost exactly in the middle between Annapurna and Everest -- 23.4% -- significantly lower than Annapurna. The fatality rate on K2 is almost exactly that of Nanga Parbat -- 24.1%. What sets Annapurna apart? What makes one 8000 meter mountain so much more difficult and dangerous than the others? I suppose no one who has not been there and tried it can truly know. You can get an idea of the mighty challenge of Annapurna from the classic book Annapurna, by Maurice Herzog (The Lyons Press, 1997). It is a fascinating but terrifying account of the successful ascent of Annapurna by Herzog's French Himalayan Expedition. The expedition set out not even knowing exactly where the mountain was. They found it, and they paid a terrible price for having done so, Herzog himself above all. He suffered massive frostbite, and the descent to base camp from the summit and the final trip down the valley became primarily a story about the day by day amputation of his fingers and toes by the the expedition doctor and the incredible suffering that Herzog endured. Another insight into the difficulty of Annapurna comes from the noted American climber, Ed Viesturs. In 1994 he launched what he called "Endeavor 8000," a project aimed at climbing all fourteen 8000 meter peaks without oxygen. At that time he had already climbed three of them, beginning with Kanchenjunga in 1989. He completed his quest on May 12, 2005, by climbing -- at last -- Annapurna. He said this about the mountain: "Annapurna is all about objective danger, it's all about the glacial architecture. There are these big ice cliffs and seracs, and the question is: are the seracs leaning forward or leaning back? It comes down to that." His account of the Annapurna climb and his earlier failed attempt on Annapurna is chronicled in his new book, Himalayan Quest: No Shortcuts to the Top. Final proof, if any is needed, of Annapurna's well-deserved lethal reputation is the fact that the Russian climber Anatoli Boukreev, who played such a controversial role on Everest in 1996 (see Into Thin Air by Jon Krakauer), but was in any event one of the great climbers in the world, died on Annapurna in 1997. Annapurna may have the most innocent, musical and softest name of all the great peaks, but that merely conceals its unchallenged standing as the most dangerous of them all. Your blog is great! Good photo of you. It was fascinating to read the history of Annapurna and how treacherous and deadly the climb can be...I'm glad you chose base camp at Everest! When you click on the two photos illustrated in the text they remain their original size? Is there any way to enlarge them so you can really see the beauty of the mountain? 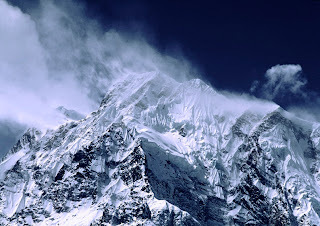 The new photos of Annapurna are GREAT! The top one, when enlarged, is truly spectacular and I felt moved by its presence...it is captivating. I hope the second photo is not a sign of global warming! Must have been taken at a different time of year? I've done a bit of research, and apparently, Nanga Parbat had a fatality rate of 77% prior to 1990. However, Annapurna followed close behind with a death rate of 66%. However, using only the data for all ascents from 1990 onwards, Nanga Parbat's fatality rate has dropped to 5.5%, while Annapurna's is at 19.7%. I imagine that the main reason these mountains have such high fatality rates is because there have been so few climbs, so those initial climbs, when the climbers had no idea what to expect, weigh much more into the fatality rates. However, I still agree with your article and greatly enjoyed it. What a wonderful article and what beauiful photos! I did the same as q, because I had my suspicions about the fatality statistics on Nanga Parbat and Annapurna compared to K2. Statistically, I'd argue that K2 is still the most dangerous - its fatality rate remains constant, whereas Annapurna's and Nanga Parbat's are skewed due to the high number of deaths early on. As has been said, "Statistics are like bikinis - what they revesl is suggestive, what they conceal is essential." Thanks to QZZ and irim for your comments. Your further research on the fatality rates would be welcome. The point is not to crown the champion but to understand better where the danger lies. When you write that Annapurna's "fatality rate" is 40.8%, you are dividing the total number of fatalities by the total number of expeditions. Which is different from finding the fraction of climbers who, having tackled Annapurna, did not return alive. This is a fraction that would be considerably lower than the one you quote. There is a documentary film about that French expedition of Maurice Herzog: "Annapurna, History of a Legent" by Bernard George. It's a great example about team building and coaching which is very needed to climb the Annapurna. Great to watch! Where can the documentary be found? Thanks for posting this. I have an abiding fascination with the Karakoram, and Himalayas. Old post but interesting read. From what I can gather, Annapurna's extreme danger stems from its penchant for ice falls and avalanches. More than perhaps any other 8-thousander, Annapurna's climbing routes put one right beneath glacial shelves where seracs are prone to break off. The most 'difficult' climb by consensus would likely be K2 or the Rupal face of Nanga Parbat.